Updated 5.49 with Luciano Busuttil's reply below - Malta Football Association president Norman Darmanin Demajo has cried foul over criticism of the national team’s recent performance by SportMalta chairman Luciano Busuttil. Dr Busuttil raised eyebrows on Tuesday when he said that he would rather watch “children play football after the Malta national team held Azerbaijan to a 1-1 draw at the National Stadium on Monday. 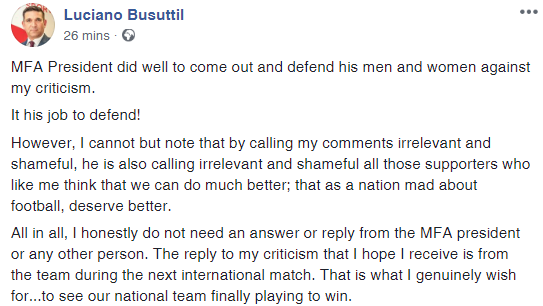 Dr Busuttil took to his personal Facebook shortly after the final whistle to chastise the national team for what he felt was a poor performance focused on defence. Mr Darmanin Demajo, described the critical comments, from the head of a body tasked with promoting sport, as “shameful”. He said he felt obliged to express his “total disapproval and condemnation” of Dr Busuttil's remarks, which publicly ridiculed athletes who worked tirelessly to represent their country to the best of their abilities. Mr Darmanin Demajo said he did not usually get involved in social media posts, saying he usually stuck by his preferred option that “silence is the best response to a fool”. However, he strongly disagreed with the former Labour MP's assessment of the team's showing, insisting that Malta had given a positive performance that earned them their first point in the competition. 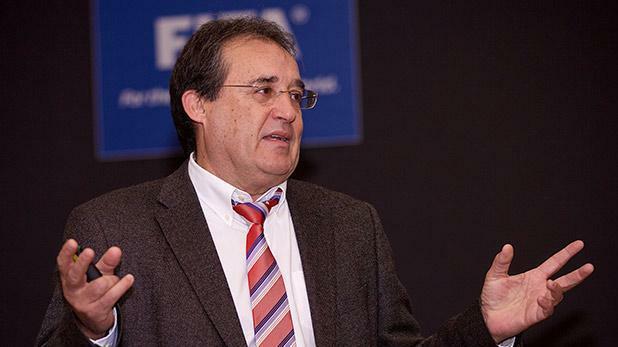 “It is shameful that the Chairman of SportMalta should publicly express himself in this way. We are all Maltese - we are all aware of the sacrifices that all our athletes in all sports disciplines in Malta and Gozo go through in order to try to compete with honour when representing their country in the international field,” he said. The MFA head asked why anyone would choose to “publicly denigrate or try to ridicule” those who had worked hard to earn the right to represent their country at the highest level. “Winning is not the most important thing, but the will to win is, and rest assured that our players and our technical staff at Ta Qali are doing everything they can to instil the will to win in our players,” he said.